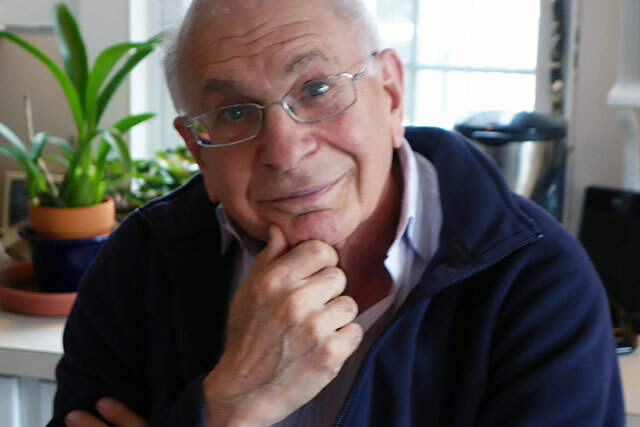 On the occasion of Daniel Kahneman's 80th birthday on March 5, 2014, Edge celebrated with a reprise of a number of his contributions to our pages. (See Edge Master Class 2007, "A Short Course in Thinking About Thinking"; Edge Master Class 2008, "A Short Course in Behavioral Economics"; Kahneman's talk on "The Marvels and Flaws of Intuitive Thinking" at the Edge Master Class 2011, "The Science of Human Nature." In the first Edge Master Class, "Thinking About Thinking" (2007), Kahneman was the teacher and the students were the founders and architects of Microsoft, Amazon, Google, PayPal, and Facebook, i.e. the individuals responsible for rewriting our global culture. Why did Jeff Bezos (Amazon), Larry Page (Google), Sergey Brin (Google), Nathan Myhrvold (Microsoft), Sean Parker (Facebook), Elon Musk (Space X, Tesla), Evan Williams (Twitter), Jimmy Wales (Wikipedia), among others, travel to Napa that year, and again in 2008, to listen to Kahneman? Because all kinds of things are new. Entirely new economic structures and pathways have come into existence in the past few years: New ideas in psychology, cognitive science, behavioral economics, law, and medicine that take a new look at risk, decision-making, and other aspects of human judgment. "Danny Kahneman is simply the most distinguished living psychologist in the world, bar none," writes Harvard psychologist Daniel Gilbert. "Trying to say something smart about Danny's contributions to science is like trying to say something smart about water: It is everywhere, in everything, and a world without it would be a world unimaginably different than this one." "It's not an exaggeration to say that Kahneman is one of the most influential psychologists in history and certainly the most important psychologist alive today," adds Harvard research psychologist Steven Pinker. "He has made seminal contributions over a wide range of fields including social psychology, cognitive science, reasoning and thinking, and behavioral economics, a field he and his partner Amos Tversky invented." His longtime colleague, (and co-teacher of the 2008 Edge Master Class, behavioral economist Richard Thaler, suggested that Edge follow up the birthday announcement by doing what it does best—asking Edgies who work in fields including, but not limited to, psychology, cognitive science, behavioral economics, law, and medicine a question. If somebody were to ask me what are the most important contributions to human life from psychology, I would identify this work [by Kahneman & Tversky] as maybe number one, and certainly in the top two or three. In fact, I would identify the work on reasoning as one of the most important things that we've learned about anywhere. When we were trying to identify what any educated person should know in the entire expanse of knowledge, I argued unsuccessfully that the work on human cognition and probabilistic reason should be up there as one of the first things any educated person should know. One way to consider the long and illustrious career of a great thinker such as Kahneman is not as a summation, but as a commission, one that gives us permission to move forward in certain ways. (Think Newton's "If I have seen further it is by standing on the shoulders of giants.") As social psychologist Richard Nisbett noted, "It's not just a celebration of Danny. It's a celebration of behavioral science." 10.01.2014 • Be imaginative, exciting, compelling, inspiring: That's what John Brockman Expects of himself and others. Arguably, the planet's most important literary agent Brockman brings its cyber elite together in his Internet salon "Edge." We paid a visit to the man from the Third Culture. Interesting news this week from Nature Climate Change which published a study by Jennifer Jacquet (Edge's Roving Editor!) and her colleagues at two Max Planck Institutes, Kristin Hagel, Christoph Hauert, Jochem Marotzke, Torsten Röhl and Manfred Milinski. 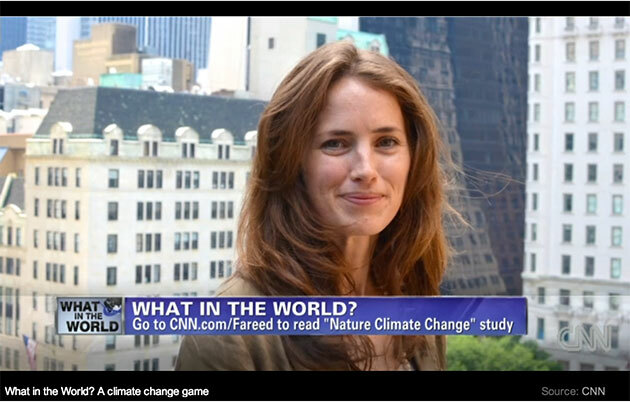 The study, designed by Jacquet, who is Clinical Assistant Professor of Environmental Studies at NYU sparked global press coverage which included articles in Time, Der Spiegel, and a 5-minute segment on Fareed Zakaria's GPS national news program on CNN on "Why in the world can't the world get consensus on climate change?" Harvard psycholgist Steven Pinker noted that the paper is "an insightful analysis of why it's so hard to come to grips with climate change." Special thanks to Rory Hawlett, Chief Editor of Nature Climate Change for opening the paywall for one month—until the end of November—to allow public access to the paper. And a tip of the hat to Nature Editor-in-Chief and Edge contributor, Philip Campbell for his continued interest and support. JENNIFER JACQUET is Clinical Assistant Professor of Environmental Studies, NYU, researching shame, cooperation and the tragedy of the commons. She is also Edge's Roving Editor (see interviews with Adam Alter and Joseph Heinrich). Why in the world can't the world get consensus on climate change? Fareed Zakaria takes a look at a new study. [JENNIFER JACQUET:] My colleagues from UBC, the Max-Planck-Institute for Evolutionary Biology, and the Max-Planck-Institute for Meteorology, and I published a study this week in Nature Climate Change where we show that when the rewards of cooperation are delayed, cooperation significantly declines. We used a 6-player collective risk game—a variant on the threshold public-goods experiment, which requires a minimal investment into the common pool (in our case 120 Euros) for the public good to be provided (in our case, an additional 45 Euros each). No single player is capable of ensuring the group's success, and a majority of players who donate nothing guarantees that the target cannot be met. As an environmental scientist interested in large-scale social dilemmas, like overfishing and climate change, this set-up is perfect to explore some of the nuances of cooperation. Last month, The New Republic published Steven Pinker's article "Science Is Not The Enemy: An impassioned plea to neglected novelists, embattled professors, and tenure-less historian" (August 6, 2013). A link to a 3-minute video attacking the article was inserted in the middle of Pinker's text—"WATCH: Leon Wieseltier's rejoinder: Science doesn't have all the answers". Billed as one of "An irregular video-interview series with New Republic Literary Editor Leon Wieseltier", the video was conveniently ready for posting within minutes of the publication of Pinker's article. Now, a month later, Wieseltier is back with a 5,650-word attack in the magazine entitled "Crimes Against Humanities: Now science wants to invade the liberal arts. Don't let it happen." (September 3, 2013). Given Wieseltier's screed, we can all be thankful that this is happening. His clueless attack is evidence that he doesn't know, and doesn't even know that he doesn't know. It's no accident that Prospect Magazine has scientists (and Edge contributors) Richard Dawkins, Steven Pinker, Daniel Kahneman, and Jared Diamond at, or near, the top of their "World's Greatest Thinkers 2013" poll ("a snapshot of the intellectual trends that dominate our age"). Or that The Guardian has proclaimed Edge the world's smartest website. Edge is pleased to publish the following response to Wieseltier from philosopher Daniel C. Dennett. 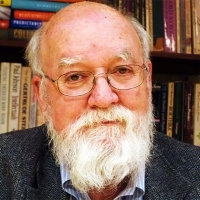 DANIEL C. DENNETT is Austin B. Fletcher Professor of Philosophy, Co-Director, Center for Cognitive Studies, Tufts University. Among his books are Intuition Pumps; Darwin's Dangerous Idea; and Consciousness Explained. Further Reading on Edge: "The Emerging Third Culture" (1991); "The New Humanists" (2000), "The Expanding Third Culture" (2006). It is not for science to say whether science belongs in morality and politics and art. Those are philosophical matters, and science is not philosophy, even if philosophy has since its beginnings been receptive to science. This is true enough, if carefully interpreted, but Wieseltier asserts it without argument, showing that he himself is not even trying to be a philosopher, but rather a Wise Divulger of the Undeniable Verities. He knows—take it from him. So this simple passage actually illustrates the very weakness of the humanities today that has encouraged scientists and other conscientious thinkers to try their own hand at answering the philosophical questions that press in on us, venturing beyond the confines of their disciplines to fill the vacuum left by the humanities. Caption1: Daniel Kahneman: xxxxx xxxxxxx xxxxxxx. Caption 2: Richard Thaler: yyyyy yyyyyyy yyyyyyy. Caption 3-4-5-6 etc. : Walter Mischel - Sendhil Mullainaithan - Eldar Shafir - Steven Pinker - Paul Dolan - Gary Klein - David Brooks - Pau Bloom - Michael Gazzaniga - Nicholas Christakis - Nicholas Epley etc etc. 1) The Corona program was of such immense historical and strategic importance because the intelligence it produced showed that the USSR did not have nearly as many missiles and launchers as we feared they did. Corona served as a much-needed damper on the Cold War arms race (pushed vigorously by that military-industrial complex that Eisenhower warned about) which might have been even worse without reliable intelligence. 2) PRISM etc. could well produce the same result--if we capture all the e-mails in the world, and break all the encryption, we may discover that the world is not nearly as full of terrorists actually threatening the homeland as certain factions are warning us to be afraid of. It may really turn out to just be mostly cat videos (and normal criminal activity). The question is, will the security-industrial complex inform us of that? 3) The current security hysteria has all the indicators of an autoimmune disease--when the organism starts reacting against itself. Dyson , in his essay "NSA: The Decision Problem", has done us a favor by connecting the dots, both backward to the origins of modern predictive algorithms and forward to the potentially stifling effect of using such algorithms to spy on personal action and speech. I wonder whether there’s another set of dots to be connected to the commercial use of data-mining and prediction tools. NICHOLAS G. CARR, former executive editor of the Harvard Business Review, writes and speaks on technology, business, and culture. 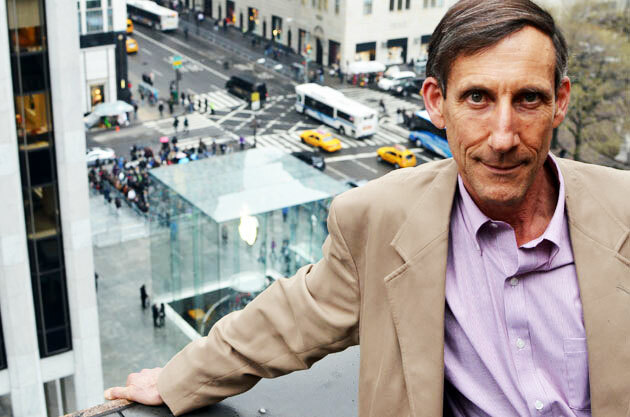 He is the author of The Shallows and The Big Switch. The ultimate goal of signals intelligence and analysis is to learn not only what is being said, and what is being done, but what is being thought. With the proliferation of search engines that directly track the links between individual human minds and the words, images, and ideas that both characterize and increasingly constitute their thoughts, this goal appears within reach at last. "But, how can the machine know what I think?" you ask. It does not need to know what you think—no more than one person ever really knows what another person thinks. A reasonable guess at what you are thinking is good enough. GEORGE DYSON, Science Historian, is the author of Turing's Cathedral: The Origins of the Digital Universe, and Darwin Among the Machines. Shortly after noon, local time, on 19 August 1960, over the North Pacific Ocean near Hawaii, a metal capsule about the size and shape of a large kitchen sink fell out of the sky from low earth orbit and drifted by parachute toward the earth. It was snagged in mid-air, on the third pass, by a C-119 "flying boxcar" transport aircraft from Hickam Air Force base in Honolulu, and then transferred to Moffett Field Naval Air Station, in Mountain View, California—where Google's fleet of private jets now sit parked. Inside the capsule was 3000 feet of 70mm Kodak film, recording seven orbital passes over 1,650,000 square miles of Soviet territory that was closed to all overflights at the time. This spectacular intelligence coup was preceded by 13 failed attempts. Secrecy all too often conceals waste and failure within government programs; in this case, secrecy was essential to success. Any reasonable politician, facing the taxpayers, would have canceled the Corona orbital reconnaissance program after the eleventh or twelfth unsuccessful launch. Read more about What is your Question from SciFoo 2013?